We find it a gratifying thing if we think about India’s 1,311 billion population (2015). Just few days after Donald Trump announced that he was withdrawing the United States from the Paris Climate Agreement, which has been criticized by all world leaders, India has to give us a lesson on how to protect our planet. In the fight against global warming, the second country in the world as a population makes major changes on its own territory, which has attracted Elon Musk’s attention as well. 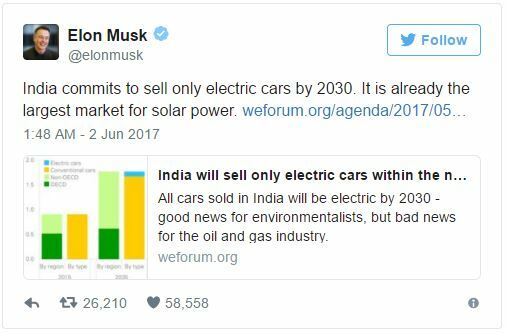 The Tesla and SpaceX CEO tweeted an article posted by the World Economic Forum about India’s recent commitment to sell only electric cars in 13 years or sooner. ScienceAlert says that those who’ve seen DiCaprio’s documentary on climate change will remember actor’s interview with India’s energy minister. She said that before talking about India, one has to look at the more developed nations and how they are serious about cutting down on their carbon footprint. However, India is finally working to change things in good. They just started to close a major coal project and focus on more renewable energy sources. As we know, solar power is cheaper than coal, meaning India has to shift to renewable sources. These efforts are vital to halting humanity’s negative impact on our world, according to environmental experts. Even with or without US’s involvement in the Paris accord, all nations must continue to use renewable energy. Otherwise the globe has to fight with major repercussions from greenhouse gas emissions.